A number of important Brodmann areas have been marked out on this diagram. Brodmann areas were originally defined and numbered by the German anatomist Korbinian Brodmann based on the cytoarchitectural organization of neurons he observed in the cerebral cortex using the Nissl method of cell staining. Brodmann published his maps of cortical areas in humans, monkeys, and other species in 1909, along with many other findings and observations regarding the general cell types and laminar organization of the mammalian cortex. The same Brodmann area number in different species does not necessarily indicate homologous areas. A similar, but more detailed cortical map was published by Constantin von Economo and Georg N. Koskinas in 1925. Brodmann areas have been discussed, debated, refined, and renamed exhaustively for nearly a century and remain the most widely known and frequently cited cytoarchitectural organization of the human cortex. Many of the areas Brodmann defined based solely on their neuronal organization have since been correlated closely to diverse cortical functions. For example, Brodmann areas 3, 1 and 2 are the primary somatosensory cortex; area 4 is the primary motor cortex; area 17 is the primary visual cortex; and areas 41 and 42 correspond closely to primary auditory cortex. Higher order functions of the association cortical areas are also consistently localized to the same Brodmann areas by neurophysiological, functional imaging, and other methods (e.g., the consistent localization of Broca's speech and language area to the left Brodmann areas 44 and 45). However, functional imaging can only identify the approximate localization of brain activations in terms of Brodmann areas since their actual boundaries in any individual brain requires its histological examination. Different parts of the cerebral cortex are involved in different cognitive and behavioral functions. The differences show up in a number of ways: the effects of localized brain damage, regional activity patterns exposed when the brain is examined using functional imaging techniques, connectivity with subcortical areas, and regional differences in the cellular architecture of the cortex. Neuroscientists describe most of the cortex—the part they call the neocortex—as having six layers, but not all layers are apparent in all areas, and even when a layer is present, its thickness and cellular organization may vary. Scientists have constructed maps of cortical areas on the basis of variations in the appearance of the layers as seen with a microscope. 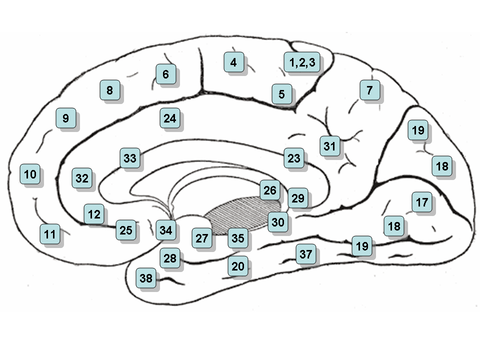 One of the most widely used schemes came from Korbinian Brodmann, who split the cortex into 52 different areas and assigned each a number (many of these Brodmann areas have since been subdivided). For example, Brodmann area 1 is the primary somatosensory cortex, Brodmann area 17 is the primary visual cortex, and Brodmann area 25 is the anterior cingulate cortex. Many of those brain areas defined by Brodmann have their own complex internal structures. In a number of cases, brain areas are organized into topographic maps, where adjoining bits of the cortex correspond to adjoining parts of the body, or of some more abstract entity. A simple example of this type of correspondence is the primary motor cortex, a strip of tissue running along the anterior edge of the central sulcus. Motor areas innervating each part of the body arise from a distinct zone, with neighboring body parts represented by neighboring zones. Electrical stimulation of the cortex at any point causes a muscle-contraction in the represented body part. This "somatotopic" representation is not evenly distributed, however. The head, for example, is represented by a region about three times as large as the zone for the entire back and trunk. The size of any zone correlates to the precision of motor control and sensory discrimination possible. The areas for the lips, fingers, and tongue are particularly large, considering the proportional size of their represented body parts. In visual areas, the maps are retinotopic; this means they reflect the topography of the retina, the layer of light-activated neurons lining the back of the eye. In this case too, the representation is uneven: the fovea—the area at the center of the visual field—is greatly overrepresented compared to the periphery. The visual circuitry in the human cerebral cortex contains several dozen distinct retinotopic maps, each devoted to analyzing the visual input stream in a particular way. The primary visual cortex (Brodmann area 17), which is the main recipient of direct input from the visual part of the thalamus, contains many neurons that are most easily activated by edges with a particular orientation moving across a particular point in the visual field. Visual areas farther downstream extract features such as color, motion, and shape. In auditory areas, the primary map is tonotopic. Sounds are parsed according to frequency (i.e., high pitch vs. low pitch) by subcortical auditory areas, and this parsing is reflected by the primary auditory zone of the cortex. As with the visual system, there are a number of tonotopic cortical maps, each devoted to analyzing sound in a particular way. Within a topographic map there can sometimes be finer levels of spatial structure. In the primary visual cortex, for example, where the main organization is retinotopic and the main responses are to moving edges, cells that respond to different edge-orientations are spatially segregated from one another. When von Bonin and Bailey constructed a brain map for the macaque monkey they found the description of Brodmann inadequate and wrote: "Brodmann (1907), it is true, prepared a map of the human brain which has been widely reproduced, but, unfortunately, the data on which it was based was never published" They instead used the cytoarchitechtonic scheme of Constantin von Economo and Georg N. Koskinas published in 1925 which had the "only acceptable detailed description of the human cortex". ^ Fales CL, Barch DM, Rundle MM, Mintun MA, Snyder AZ, Cohen JD, Mathews J, Sheline YI (February 2008). "Altered emotional interference processing in affective and cognitive-control brain circuitry in major depression". Biol. Psychiatry. 63 (4): 377–84. doi:10.1016/j.biopsych.2007.06.012. PMC 2268639. PMID 17719567. ^ Brent A. Vogt; Deepak N. Pandya; Douglas L. Rosene (August 1987). "Cingulate Cortex of the Rhesus Monkey: I. Cytoarchitecture and Thalamic Afferents". The Journal of Comparative Neurology. 262 (2): 256–270. doi:10.1002/cne.902620207. PMID 3624554. ^ Gerhardt von Bonin & Percival Bailey (1925). "The Neocortex of Macaca Mulatta". Journal of Anatomy. Urbana, Illinois: The University of Illinois Press. 82 (Pt 4): 271. PMC 1273070. Wikimedia Commons has media related to Brodmann areas. Brodmann areas Brodmann areas of cortex involved in language. Illustrations[permanent dead link] More Illustrations.